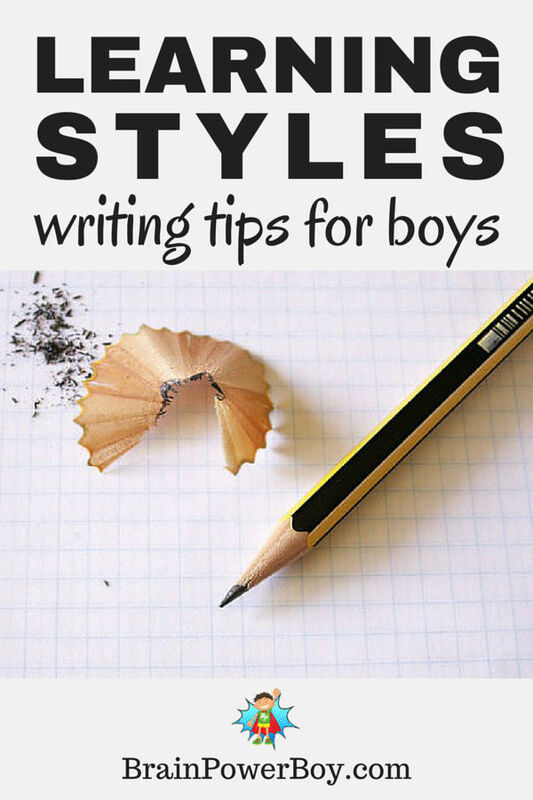 Use these learning styles writing tips for boys to help your boy express himself through writing. Learning styles can be used to find great ways to help boys with their writing and they are all easy to implement. Read on for further information. Some boys find writing to be a physical challenge. Others don’t enjoy writing because too much emphasis is placed on penmanship and what their end product looks like. Take away those obstacles and you give boys a chance to express themselves. Writing is an important way of communicating and should be encouraged, but not forced. Changing a few small things for a boy can make all the difference. Anything you can do to help a boy learn to enjoy writing is going to help him in so many areas of his life. Writing can be so rewarding for boys that it is important to make the whole process easier. Use the writing tips found here to change your boy’s relationship with writing for the better. To dive deeper into each learning style you can visit our boys’ learning styles page. I found an interesting article to share with you that ended up leading to this post. I was just going to share the article on social media but realized I had quite a bit more to add. I hear a lot about boys not wanting to write. For some it is the physical act of writing that causes a problem; for others they have a hard time getting started or feel that they aren’t good at writing. Adjusting the way your boy approaches writing could help him to develop a love of communicating through writing. Here are some writing ideas you can have your boy try to see what works best for him. Keep in mind that many people have overlapping learning styles so try tips from the different learning styles your boy may have. See images when thinking about things. They can use this ability and simply describe what they see in their mind’s eye. Give them colored markers or colored pencils to write with. They can draw mind maps. They can also draw pictures, paint or daydream about their story before writing things out. Graphic novels can be a big inspiration to visual-spatial learners. Can act out what their character would be doing, and saying. They can also role-play to try out different ideas. Let them write on the computer if that works better for them. Letting them move around while dictating what they are writing works really well for them. Enjoy using quotes and dictionaries as well as recording their stories before writing them out. They love playing with words and may enjoy that aspect of writing as well. They might like writing jokes or poems. Try Funny Poetry Books for Boys to give them some inspiration. Could use outlines and other ways to order the story before beginning. They can look for connections and patterns and apply those to their writing. Turning on music they enjoy before starting would benefit a musical learner. Or they could try to find music that their character would like. You can also tell them to think about the rhythm of a story and how words can flow like music does. Let them try writing song lyrics. Write best in the environment that they enjoy the most. Set up writing materials outside for them to use at their leisure. They can also draw out their ideas and think about how what they are writing relates to nature. Naturalistic learners are very detail-oriented and can use that to their advantage when writing. Might like to write alongside others or collaborate with others on a writing project. They also like to bounce their ideas off others. They are very empathetic and understand people. They could bring those qualities into their writing. Interpersonal learners might be inspired by reader’s theater or writing plays. Would be best left alone to write on their own. Give them plenty of time to write without pressure from anyone. Offer supplies and give them a space to set up a writing area if they would like to do so. They may enjoy writing in a journal that can be kept private. For more ideas see Great (book) Expectations’ article on writing and learning styles. Some ideas from the article are more adult oriented such as touring a winery if the character drinks wine 🙂 however, I’m sure you get the idea. She mentions using the Vark test to see what learning style you are. I am not too fond of it but feel free to try it yourself and see what you think. Getting boys writing doesn’t have to be like pulling teeth. You just have to follow their passions and find the way that works best for them to communicate their ideas through the written word. I encourage you to learn more about learning styles by checking out our Learning Styles Overview. If you enjoyed this article please share it with others using the sharing buttons below–thanks! Wonderful article Sheila. It’s so important to understand how our boys learn to help making learning easier and more fun for them. Your suggestions really helped me understand how my little one is learning best. Thanks so much for sharing your thoughts. I can’t wait to try to adapt some of our at home activities to fit him better. Alli, Thank you for the kind words. I am so happy to hear the article was helpful. That means a lot coming from you. Appreciate the share! Thanks so much Lauren. I am glad you like it. Boys can have a hard time with writing because of the physical part of it. Not sure how old your son is but I hope you get some ideas that will work for him. These are wonderful tips! Writing can be so wonderful for kids, and I will definitely use these tips for my three boys when we get to that stage! Oh my goodness – I never knew about all of these learning styles but seeing this all laid out and how to put it into practice is so useful! Thank you for taking the time to share your thoughts on this. I’ve learnt something new and very important today. This is so great Sheila! I love that you broke this down my learning styles. So helpful. Thanks for sharing! Thank you Erin. Your comment means a lot and I am so glad to hear it is helpful to you. I have a series planned. Thank you so much for linking up to Merry Monday this week! I am sharing your post today on my G + We hope to see you next week for another great party! Have a great week! Thanks Otilia, it is nice of you to stop by and comment. I appreciate it.